It is surprising that there are so many people allergic to nuts in the 21st century. Even the slightest exposure for the sensitive can result in breathing difficulty, swelling of airways, rashes and sometimes worse. ‘Late onset’ nut allergy though is a relatively recently discovered phenomenon. It afflicts middle aged males more than any other group, and particularly those who restore old cars. Even more rarely diagnosed is the occasionally fatal late onset bolt allergy. I think it has afflicted me – and like the flesh eating bug no-one knows how it is transmitted. I have been preparing to chassis coat the skeletal remains of the 1926 B2 Citroen ‘Caddy’ replica. I am cleaning and polishing every single component that makes up the suspension. Soon, so the theory goes, the chassis will be standing on its own four wheels. This requires patience and tenacity in preparing the running gear, stripping, cleaning, repairing, priming and then painting every part. The leaf springs, both axles, the shackles, the suspension mounts… and even every single ancient nut and bolt. Each bolt, nut and spacer is being spruced and polished. Along the way I have managed to also shed several layers of my epidermis. The bolts are a curious type, boasting a thin head of uneven sides and decorated with a star pattern, looking like a startled metal snowflake. They boast 24 threads per inch, and despite the French adopting metric-everything sometime back when Napoleon was calling the shots, these bolts are all 3/8". The acquisition of a tap and die set for the restoration of the threads was itself worthy of a soap opera. I decided I wanted to retain originality [yes, I know…. 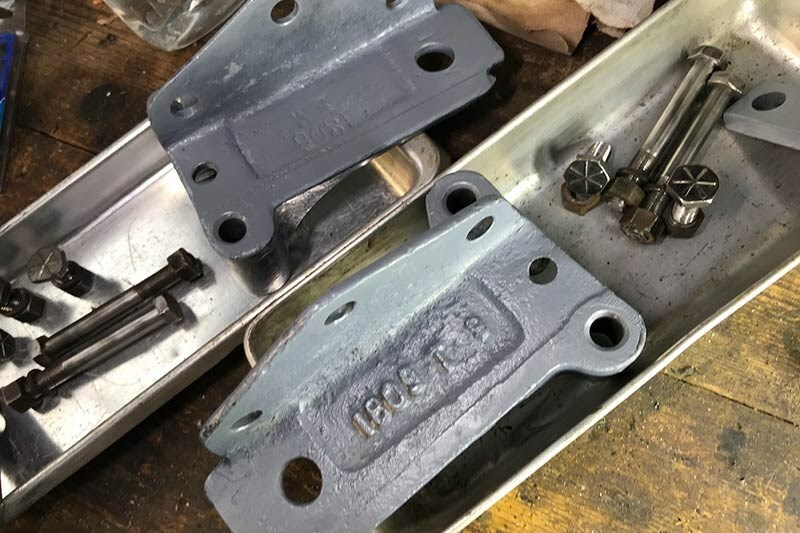 I am building a replica] and thus want to re-use as many of the 1926 bolts as I could, and only replace them with modern ones if absolutely necessary. 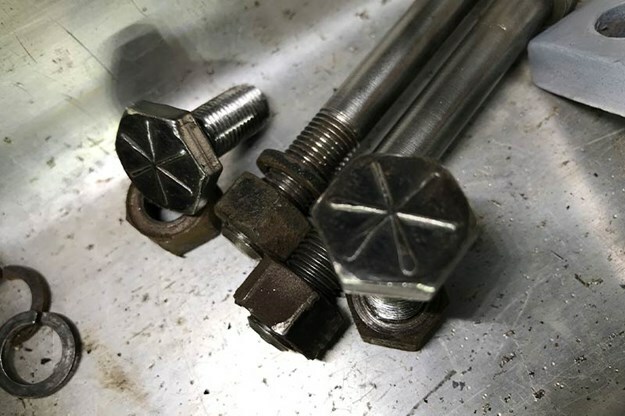 Given how unusual the bolt heads are, and as they are asymmetrical with different lengths to the flats depending on their placement, I thought this made eminent sense. It is an essential part of the character of the car that it has these crazy snowflake headed bolts everywhere. Since the Citroen B2 engine output is around 10hp and top speed optimistically may occasionally reach the vicinity of about 70kph I will have plenty of time to admire the fixtures and fittings. 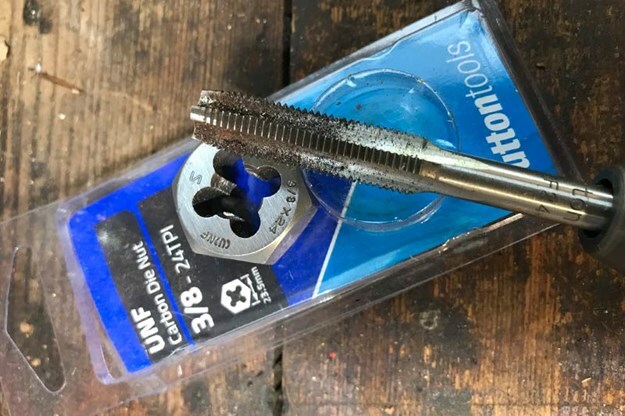 The ever helpful chap at the local specialist bolt shop swore a few times when I presented my sample, retreated hurt to the back-room and eventually emerged triumphant. He had applied the thread gauge, identified the culprit and happily produced a nut repairing tap. I smiled and asked if it was asking too much to match it with the appropriate bolt thread repairing die. A return trip to the cupboard and it was produced. Then I dared ask if he had 20 matching bolts he could sell me. After what seemed like a long weekend, he re-appeared from out the back and triumphantly declared he had found 24tpi steel bolts of the equivalent lengths, and behaved like an excited puppy holding aloft a tennis ball it has chased for the first time. However he seemed to be personally offended when I pressed him to match the bolts with suitable nuts. He had not thought to do so until I especially requested it. Now as a former professional storeman (1977 during my gap year at uni) this seemed to me to be Stores 101. I also worked in grog shops right through my studies, and was taught very early on "you always give the customer more than they asked for". But not here. In this shop you begrudgingly stomp back to the warehouse and sulk. So now I am armed with tap, die, spare nuts and bolts and rattle can paint primer. As winter progresses I will keep skinning my fingers on the wire wheel, stripping paint and grime from piece after piece and hopefully by the time it is warm enough to paint the chassis, will have overcome my nut allergy and have all my bits ready to reassemble. Now where did I file the photos of how it all came apart?